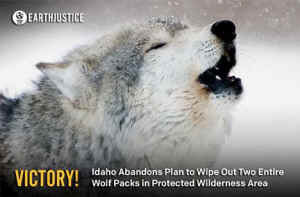 Earthjustice went to court to stop Idaho from exterminating the Golden and Monumental wolf packs in central Idaho’s Frank Church—River of No Return Wilderness. And we won! The Idaho Department of Fish and Game announced that it is halting its wolf extermination program as of today. This will stop the wolf killings and restore the natural balance between predator and prey in the Idaho wilderness area. "This is bittersweet news,” said Ken Cole with the Western Watersheds Project. “I am happy that IDFG has relented but it is unfortunate that so many wolves have been taken in this senseless plan to manhandle wildlife in an area that Congress recognized as a wilderness 'where the earth and its community of life are untrammeled by man'"